Welcome to the website of the Six-Gs group – global amateur radio DXpeditioning. On these pages you will find details of previous and up-coming DXpeditions by the Six-Gs. Please use the menu to the left of this page to select the DXpedition of interest. Some years ago many members of the Six-Gs group were involved in mega-DXpeditions – some of the most successful and largest in history. But unless budget is no constraint, large scale DXpeditions place limitations on which countries can accommodate a major expedition. We felt that there was a lot of enjoyment to be gained from small self-managed expeditions, done on “fly-in, fly-out” basis, and where all equipment was hand carried to the destination without the use of freight shippers. Our first application of these principles was in 2014 at TX6G in the Austral Islands, which made some 78,000 QSOs. 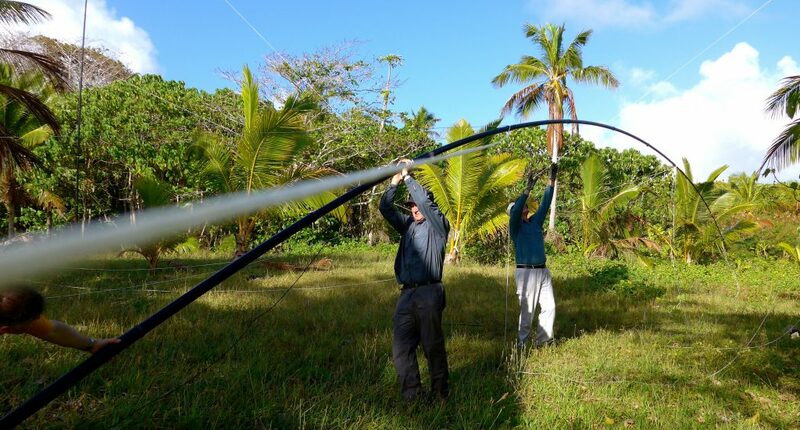 Encouraged by this, we ventured to Niue in 2015, making some 47,000 QSOs as E6GG. In 2016, we travelled to Chatham island and put ZL7G on the air. For 2018, an expedition is planned to Christmas Island. Details of all these expeditions can be accessed via the menus on the left. At the 2017 GMDX Convention it was announced that the ZL7G DXpedition had been awarded the GMDX Group DX Award of Excellence. Chris Duckling, G3SVL and Nigel Cawthorne, G3TXF accepted the award on behalf of the 6Gs. We are grateful to the GMDX Group for recognising the ZL7G team in this way.